Lately, I've been thinking hard about bus routes that we need. Living in the Canning contract area, I can see several areas that either have a very low quality service or no service at all. The following are suggestions that I have. From a stop near Canning Vale depot on Bannister Rd, via existing 75 route to Willeri Dr/High Rd then via High Rd, Leach Av, Corinthian Rd, Veronica St, Barbican St E, then via existing 75 route to Esplanade Busport. Hours of operation: Monday-Sunday, 15min during peak periods, 30min off-peak, 60min nights, 30min Saturdays, 60min Sundays. Timetabled with route 72 to form an ultra-high frequency between Curtin University and Perth City. From a stand at Bull Creek Station, via Leach Hwy, Bull Creek Dr, Camm Av, Parry Ave, Benningfield Rd, South St terminating at Murdoch Station. Hours of operation: Monday-Saturday, 20min during peak periods, 60min off-peak, 60min Saturdays. From a stand at Bull Creek Station, via Leach Hwy, Karel Av, Apsley Rd, Vahland Av, Collins Rd, Willeri Dr, Vellgrove Av, Pegley Dr, Lyndale Av, Hossack Av, Willeri Dr, Riley Rd, Riverton Dr E, Fern Rd, Bungaree Rd, Leach Hwy, Manning Rd, Cecil Av to Cannington Station. Hours of operation: Monday-Sunday, 15min during peak periods, 30min off-peak, 60min nights/weekends. Via existing route 508. Hours of operation: Monday-Sunday, 15min during peak periods, 30min off-peak, 60min nights/weekends. From a stand at Bull Creek Station, via existing 170 route to Leach Hwy/Bungaree Rd then via Leach Hwy, Braibrise Rd, Manning Rd, Albany Hwy, Cecil Av to Cannington Station. Hours of operation: Monday-Sunday, 15min during peak periods, 30min off-peak, 60min nights, 30min Saturdays, 60min Sundays. From a stand at Murdoch Station, via existing route 515 to Farrington Rd, then via existing route 516 to South Street via Casserly Dr, then via South St returning to Murdoch Station. Hours of operation: Monday-Sunday, 15min during peak periods, 20min off-peak, 60min nights, 30min Saturdays, 60min Sundays. From a stand at Bull Creek Station, via Leach Hwy, Karel Ave, Acanthus Rd, Asler Av, Apsley Rd, Pinetree Gully Rd, South St, Beasley Rd, Karel Av, South St to Murdoch Station. Hours of operation: Monday-Sunday, 15min during peak periods, 60min off-peak, 60min weekends. From Murdoch Station, via South St, Karel Av, Berrigan Dr, Jandakot Rd, Warton Rd, Armadale Rd, Beeliar Dr, Midgegooroo Dr, Stockton Bnd to Cockburn Central Station. Hours of operation: Monday-Saturday, 20min during peak periods, 60min off-peak, 120min Saturdays. Via existing 206, 207, 208, 850 and 851 routes. Alternating services every 6min peak/off-peak, 12min nights/weekends. Via existing route 507. Hours of operation: Monday-Sunday, 10min during peak periods, 15min off-peak, 30min nights/weekends. From a stand at Bull Creek Station, via Leach Hwy, High Rd, Nicholson Rd, Albany Hwy, Liege St, Grose Av, Carousel Rd, Cecil Av to Cannington Station (returning via Cecil Av, Albany Hwy, Nicholson Rd then reverse of the above). Hours of operation: Monday-Sunday, 10min during peak periods, 20min off-peak, 60min nights, 30min Saturdays, 60min Sundays. More services in Landsdale, Madley and Darch with more late night services and sunday services. More improves direct express and limited stop services along the northen corridors again more late night and sunday services. laptop15 wrote: More services in Landsdale, Madley and Darch with more late night services and sunday services. More improves direct express and limited stop services along the northen corridors again more late night and sunday services. Yeah, I agree. Bring back the 366 and make the 66 an express service again. The Landsdale/Darch/Madeley needs a 7-day-a-week reasonable frequency service that operates between Whitfords and Mirrabooka. I have written them a letter as well to mention about the Landsdale bus services improvement. They gave me a call few days later and said route 352 will be replaced by a new route. This new route is still deciding the exactly route , but most of the suggestions will be extend the route 372 terminus to Whitfords Interchange via old 352 route from Darch area. They will also keep in eye on the route 376 runs. More additional runs may be seen later. On the other hand is, it may also have a new route from Landsdale to Greenwood train station after the 352 is cancelled. These are all just part of their ideas I've been told. It is still not be confirmed yet. Noticed by Path Transit. Thank you for your attention. After seeing first hand the S**T schedulers and planners put up with, not to mention thier workload, you wouldnt get me in there for quids ..
"A word to the wise is not necessary - it's the stupid ones that need the advice." Location: somewhere between here and there ..
Last time I talked to them about landsdale services they said they cant do it just because I want it, but im not the I only one who wants aleast sunday services. Southern Landsale dont have any services nore does northen Darch/Madley on Sat and everywere Sunday, extending the 372 is a good idea but makes it long trip for start to finish. But if they do cancell the 352 and extend 372 i hope they do put a service from Landsale to the train line, I hate going to Mirrabokka. And please services after 7 and sunday services transperth!!! Remove Ellenbrook Transfer Stn and replace it with a bus depot of capacity of +50Vehicles other than the current 20capacity depot. Route 338 Ellenbrook-Henley Brook-Aveley South-Ellenbrook Local Service M-F30MINS,PEAK20MINS,WEEKEND AND NIGHT 60MINS. Along existing route to Gnangara road then through Henley Brook and Aveley (South Only) and back to Ellenbrook. Route 339 Ellenbrook-Woodlake Blvd-Aveley North-The Vines(East Side! Not Golf Course!) Same frequency as 338. Along existing 336 route to Galatea Ps then route decided after. Along existing 338 to Coolamon Blvd then via same route as 340. Last time I talked to them about landsdale services they said they cant do it just because I want it, but im not the I only one who wants aleast sunday services. Southern Landsale dont have any services nore does northen Darch/Madley on Sat and everywere Sunday, extending the 372 is a good idea but makes it long trip for start to finish. But if they do cancell the 352 and extend 372 i hope they do put a service from Landsale to the train line, I hate going to Mirrabooka. And please services after 7 and sunday services transperth!!! I agree, I really have no idea why they don't put more 352 services so passengers can choose them then catch trains to city or up north area. Also, the train runs every 15 minutes so it is very easy to pick up the passengers by train, instead of 376 to Mirrabooka. There are only few 377 extention services back to Landsdale. It is used long time to travel the 354, then 377 (Left , right, left, right..) then 376 route. Have they cancelled building the railway line to Ellenbrook? It is not enough to use 336 then transfer buses (Eg. route 60) to city. I agree with most of what Dave said. Leeming Definately needs an after hours service as it has not had one since the days of the old 195 Booragoon - Yangebup service. 519 Keep route as is but extend to Kelmscott from its Harrisdale Terminus via Wright Rd, Right at Ranford Rd, Left Lake Rd, Right Champion Dve, Left Westfield Rd, Right Railway Ave to Terminate at Kelmscott Interchange. This gives area like Ranford Rd south of Warton Rd a service. I agree with PBCNG and LeylandB21 except that the 32 should terminate on Kintail Rd then leave via, Kintail, L.Forbes/Sleat, L. Canning to pick up the route that B21 proposed. Bus-1809 wrote: I agree with PBCNG and LeylandB21 except that the 32 should terminate on Kintail Rd then leave via, Kintail, L.Forbes/Sleat, L. Canning to pick up the route that B21 proposed. Canning Bridge does NOT have a suitable layover facility for terminating services. Would a flexibus system work for late night routes? A flexibus system is where after a certain time the driver waits at the train/bus station & takes whatever passengers on a more direct route to the passengers nearest stop. If people in the suburbs wish to catch this bus they call up & on the way back the driver will pick them up from the nearest stop. You could also run direct services from train stations to bus stations that are out of the way. An example would be the 920 would run from Fremantle to Rockingham. But would only stop at shopping centers or Kwinana Bus Station. Route 540 would then be set aside for the whole Kwinanna area. So the driver would run from start at Kwinana Station, Kwinana Bus Station & Wellard Station (only if confirmation of passengers from station staff). If there are any passengers he would drop them from the nearest bus stop. Because only one bus is set aside for the Kwinanan region, the Wilson security car could stay with the one bus the whole time & not check on a few buses at once. Of course if some services regularly get a high number of passengers then those routes can stay the same track. Also for the stingy Government, as some buses will be on the road less less petrol will be used. Although cover your eyes, some drivers will be paid for doing nothing at times (uncover your eyes now). Bus 400 wrote: Would a flexibus system work for late night routes? No, not with the way that the Government pays the contractors. Petrol and buses? You're joking, right? I was talking to Public Servants, I could say buses ran on food & they would believe me. 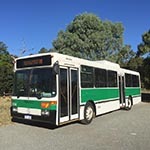 I reckon run a bus outa WSBS via old yellow clipper to the terrace, over the causeway bridge via vic park to armadale, onto armadale rd to the kwinana fwy then south to lake clifton via fwy and forrest hwy returning to mandurah via dawesville and continuing north to rocky via mandurah rd and further north again to freo via rocky rd (yes via kwinana hub); then via route 381 to scarborough and then via west coast hwy/marmion ave through mullaloo-kinross-clarkson-yanchep-two rocks and returning via wanneroo rd to wanneroo skirting over to mirrabooka and morley then via beaufort st ALL-STOPS into the city turning right at wellington st to terminate on A row WSBS before departing again. Mon to Sun 0500 to 0155 every 3 minutes. insert_coin wrote: I reckon run a bus outa WSBS via old yellow clipper to the terrace, over the causeway bridge via vic park to armadale, onto armadale rd to the kwinana fwy then south to lake clifton via fwy and forrest hwy returning to mandurah via dawesville and continuing north to rocky via mandurah rd and further north again to freo via rocky rd (yes via kwinana hub); then via route 381 to scarborough and then via west coast hwy/marmion ave through mullaloo-kinross-clarkson-yanchep-two rocks and returning via wanneroo rd to wanneroo skirting over to mirrabooka and morley then via beaufort st ALL-STOPS into the city turning right at wellington st to terminate on A row WSBS before departing again. How long would that take? 5, 6 hours? You would need alot of short workings to make it workable. The last service would have to depart around 4 -5 pm or it would run to late. more to add, after doing some investigating!!! 240[ b] Delete It[/b] Replace with new route 241, Service runs as follows, Via normal route 241 to Peet Rd. Then Instead of turning into Peet Rd from Brookton Hwy, Service continues up Brookton Hwy, left Westbourne Rd, Left Northward Rd, Right Valley View Rd, Right Holden Rd, Left Raeburn, Left Peet Rd, Right Urch Rd, Left Canning Mills Rd, Right Clifton St, Right Martin St, Left Merrilee Tce, Left Connell Ave, Right Lucich St, Right Martin St, Left Gilwell Ave, Right Denny Ave, Right Railway Ave into Kelmcott Interchange. This kills 2 birds with one stone, keeping the service circular, Not as many steep inclines like Peet Rd as your heading reverse. Leyland B21 wrote: Not as many steep inclines like Peet Rd as your heading reverse. It's the harsh elevations of Peet Rd and Valley View Rd that make route 241 interesting! TP3002 Master Plan. Different to the first. Change route into cat like service for weekdays only. Extend to Morley via existing 20 route. Run as a limited stop service to Dianella then all stops to Morley Senior High School with selected services extending to Morley on weekdays. Run from Morley down existing 60 route then along existing 16 route to Dianella then down to Yokine via ECU Mt Lawley. (Note. Service is not a direct service to ECU. Normal route with deviations to ECU every 60mins during day and every 30mins during morning and afternoon Uni Days. Last edited by Mr OC Benz on Sun Oct 11, 2009 6:28 pm, edited 1 time in total. TP3002 wrote: TP3002 Master Plan. Different to the first. what exactly is the proposal for this route? Minor time changes to coincide with other buses from other locations. i.e Morley, ECU maybe North Perth. Never living in the northern suburbs with the exception of Claremont and Herdsman as i resided in Armadale for most of the 28 yrs i lived in Perth, how far exactly is Bradford St/Alexander Dve from ECU? Im under the understanding that route 19, especially with its Menora Homes deviation surely cant be that far away!!! 276-277-278 re-numbered 406-407-408 and extended to Stirling to "re-vitalise" some pretty tired workings that aren't offering anything new within their vicinity.